Our company is, and always has been, family owned. Our company is, always has been, family owned. Our Norwegian founder built windows specifically designed to withstand the most fierce winter weather our climate can dish out. Not much has changed; we still look at our team as OUR family. 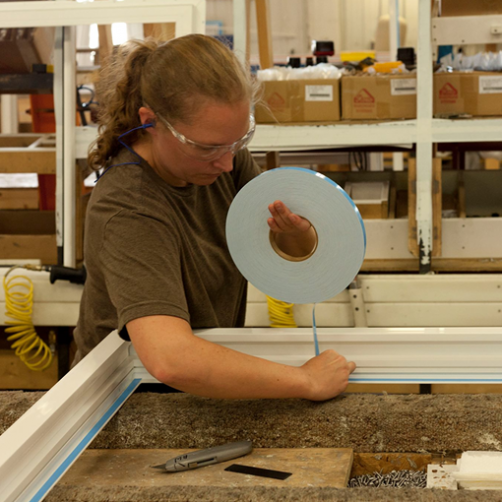 Each day our windows are manufactured one at a time, by hand. Our windows pass assembly and inspection by many skilled hands. If you add them all together, the experience in those hands is an extraordinary 582 years of building the best built, best backed windows in the business. Meet some of our family: Todd in Shipping: Wrapping windows, foaming windows, loading semis for transporting windows. If we do it in a timely fashion it satisfies the customer and gets the orders out in time. Roger on the Production Floor: After the pieces are welded, I put them through my machine to clean the weld area on the corners. It's important because it needs to be clean to fit properly. Holly in Hardware: We put the hinges, operators and all the stuff that goes on the window to make it operate. Everything goes in a certain spot and they need to be placed accurately. It's important so everything lines up and keeps the sash tight in the frame. That's just a few of the hard-working people we have putting your windows together. We’re proud of our team and what they accomplish. Everyday. So when you’re building or remodeling, ask for Minnkota Windows. Midwest Built, Midwest Tough, Guaranteed for Life!